The idea for this piece originated immediately after I learned about Frank Gehry's wonderful architectural project for the Pierre Boulez Saal. The two weightless ovals that envelop the space like a band instantly made me think of a Moebius strip, that paradoxical geometrical figure that unites the inner and outer surfaces of a particular space in one continuous transition. When we move along this band, we are transported, as it were, into the opposite dimension without crossing a spatial border. This became the idea for my piece: to present the process of the musical material "flowing" from one quality into the opposite as a specific type of perpetuum mobile — a kind of Perpetuum Moebius. The piece is dedicated to the musicians of the Boulez Ensemble. Die Idee zu dem Stück entstand unmittelbar nachdem ich das großartige Architekturprojekt von Frank Gehry für den Pierre Boulez-Saal kennengelernt hatte. Die zwei schwerelosen Ovale, die wie ein Band den Raum einfassen, brachten mich sofort auf den Gedanken vom Möbiusband, jener paradoxen geometrischen Figur, die in ununterbrochenem Übergang die innere mit der äußeren Seite des Raumes vereint. Wenn wir uns auf diesem Band bewegt, geraten wir gleichsam in die entgegengesetzte Dimension, ohne eine Raumgrenze zu durchschreiten. Das wurde zur Idee meines Stückes: den Prozess des "Hinüberfließens" des Klangmaterials aus einer Qualität in die entgegengesetzte als eigentümliches Perpetuum mobile darzustellen. Eine Art von "Perpetuum Möbius". Das Stück ist den Musikern des Pierre Boulez Ensembles gewidmet. Caroline Melzer, soprano; Axel Bauni, piano. that the speech of a blessed fool should burn? Onto the music books in the shelf. Of asters and dahlias should suffer? Silence, is in the details. dass man des Toren Wort verbrenne? So schaukeln sie hinab, hinab. Und wie geschleust durch eine Jalousie. Du fragst, Freund, wer befiehlt? Erfüllt von Wundern im Detail. The title Tabula Russia presents a phonetic and semantic allusion to the well-known Latin expression tabula rasa ("blank slate" in English). This is how the wax tablets used for notating texts were used in antiquity. Before a new text was inscribed, the old text was erased (by smoothing out the wax), so the expression tabula rasa contains in itself a certain "double code" – the mystery of the previous text and the riddle of the future not yet written. 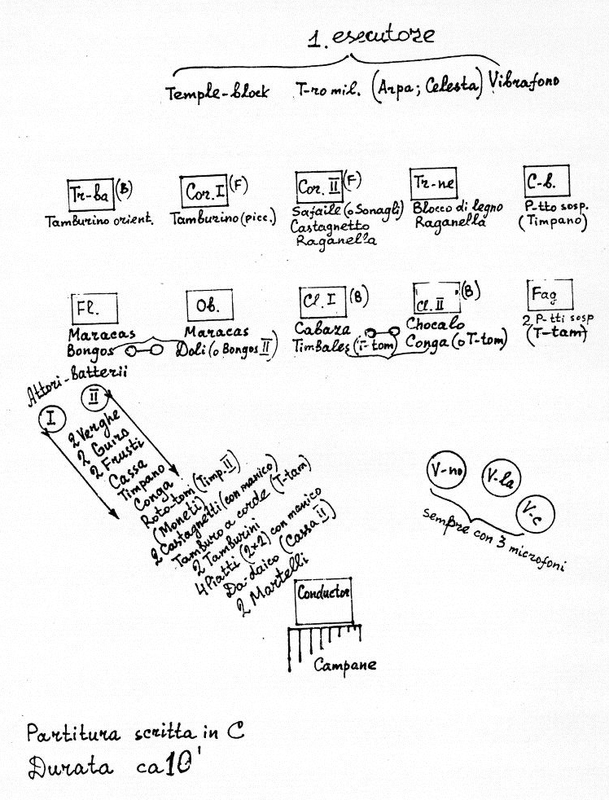 The composition "Tabula Russia" was written especially for a festival devoted to Sergei Rachaninoff, one of the remarkable Russian composers. I tried to bring in here allusions to the bell-like sound quality permeating his music, elements of strict liturgical prosodies and exulted Eastern chants dissolving in yet another "obliterating current" of time. The main sonar idea in my composition, which became its initial impulse, was the sound of the Russian low bell, which has been the sonic symbol of Russia from the earliest times. In Russian bells, unlike most of the European ones, there is an oscillation not of the cupola, but of the bell, which makes it possible to make/mould very large bells that emit very low tones, extremely abundant in overtones. This "primeval" bell rumble forms a remarkable combination of the harmonious cosmos of overtones and the chaos of the multitude of "arbitrary" side-tones, a peculiar kind of sound "chaosmos." Chaos fraught with cosmos or, on the other hand, orderliness fraught with chaos – this metaphor, as it seems to me, contains an important archetype of the "Russian consciousness." Russia, being in search for its identity, continuously rewrites its own history, each time starting from a "tabula rasa", indulging in or plunging into extremities and each time "erasing" its previous meanings in its attempts at searching for an ideal utopia. The composition is dedicated to Valery Gergiev. The main idea for this composition was inspired by a set of snapshots obtained by means of the "Hubble" telescope. Following hitherto unfathomable laws of nature, orderly stellar systems are formed from clouds of gas and nebulae, emanating powerful currents of light and energy. These galaxies and stellar nebulae demonstrate color spectra of fantastic beauty and an astonishing variety of forms: ellipses, spirals and innumerable irregular structures. Appearing to be immobile to the lay observer, in reality, following the law of the red shift, discovered by astronomer Edwin Hubble, these hyper-gigantic formations move away from each other with an incredible, continuously increasing speed. This results in the calm grandeur of the universe which in reality presents a monstrous energy of constant motion, one that simultaneously is creative and destructive. My composition expresses a peculiar sound metaphor of Hubble's idea. Out of an amorphous mass of the "sound nebula" the fractal pitch structures gradually crystallize. In a similarly gradual way the "syntactic gravitation" forms large-scale phased periods. The dramatic play of matter and energy, the changeover of one to the other, leads to a constantly accelerating expansion of the sound space. The principle of the red shift — the visual indicator of the grandiose expansion of the universe — is imprinted in the musical texture, not only metaphorically, but also structurally. In the formation of the composition's parameters of sound, the idea of phased shifts is reflected in shifts of pitches — the intervallic displacement of adjacent sound fractal chords — and shifts in the frequency domain — mutations of the timbre. L'idée principale de cette composition a été inspirée par une série de clichés obtenus au moyen du télescope "Hubble". Suivant des lois jusqu’ici insondables de la nature, les systèmes stellaires ordonnés sont formés à partir de nuages de gaz et de nébuleuses, émanant de puissants courants de lumière et d'énergie. Ces galaxies et nébuleuses stellaires montrent des spectres de couleur d’une beauté fantastique et d’une étonnante variété de formes : ellipses, spirales ainsi que d’innombrables structures irrégulières. Apparemment immobiles pour l'observateur profane, en réalité, suivant la loi du décalage vers le rouge (red shift) découverte par l'astronome Edwin Hubble, ces formations gigantesques s'éloignent les unes des autres à une incroyable vitesse en constante augmentation. De ceci résulte l'apparente calme grandeur de l'univers, qui en réalité recèle une énergie monstrueuse en mouvement constant, énergie à la fois créatrice et destructrice. Ma composition est l'expression d'une métaphore sonore spécifique à l'idée de Hubble. Émergeant d'une masse amorphe de la "nébuleuse sonore", les structures fractales de hauteurs se cristallisent progressivement. D'une manière similaire et progressive, la "gravitation syntaxique" crée de larges périodes reposant sur des décalages de phase. Le jeu dramatique entre matière et énergie, le passage de l'un à l'autre, conduit à une expansion constante et croissante de l'espace sonore. Le principe du décalage vers le rouge — l'indicateur visuel de l'expansion grandiose de l'univers — est imprimé dans la texture musicale, non seulement métaphoriquement, mais aussi structurellement. Dans la formation des paramètres de la composition sonore, l'idée de décalages de phase se traduit par des décalages de hauteurs— c'est-à-dire par la transposition d'accords fractals adjacents — et par des décalages dans le domaine des fréquences — c'est-à-dire des transformation du timbre. Klangforum Wien, Sylvain Cambreling, cond. This small piece presents a sort of compositional study based on the idea of Roland Barthes about "writing degree zero." It is an attempt to work with the most neutral type of musical material, bereft of any mythology, the most crucial aim of which is to create a "speaking" form with a sculpture-like relief. The piece was written upon commission from the Klangforum Wien ensemble for the bicentennial anniversary if Liszt in Weimar. Ens: 1.1.2.1. – 2.2.1.0. – 2Perc.- 2Pf(2 also Synth) – 1.1.1.2.1. Ens: 2.0.1.0 – 2Sax – 2.2.2.1. ElGuir.BGuit- 3Perc.- Pf.Synth.Bayan – 2.1.1.1. FP: 20 September 2006, Beethovenfest, Kunst- und Ausstellunghalle. Opera Bonn, Palindrome Dance Company, MusikFabrik ensemble, cond. Wolfgang Lischke. Staging — Robert Wechsler. Voices: 2Sopr,MSopr, Ten, Bar, Bas. Ens 1 (right): 1.1.1.0 – 1.0.0.0.- 2Perc.- Pf(=Synth.) – 1.1.1.0. Ens 2 (left): 1.0.1.0 – Sax – 0.0.1.0.- 1Perc.- Hp – 1.1.1.1. FOUCAULT'S PENDULUM was written in 2004 on a commission from the Dutch Schoenberg Ensemble. Its world premiere of the composition took place the same year at the Concertgebouw under the direction of Reinbert de Leuw. I tried to construct my piece on the basis of juxtaposition of two contrasting types of music: the music of breath and the music of mechanism, as well as, correspondingly, two types of time – the continuous and the mechanically discreet. It was especially intriguing for me to examine the processes of the emergence and formation of each type of music, and also to trace the stages of the transition of one into the other. I was also greatly interested in the idea of the gradual modulation of the timbral beats of sound into rhythmic structures, as well as the transformation of instrumental sound-color into rhythm. The pendulum-like development of the musical material of the piece (involving repetitions with gradual changes of the "trajectory" of the movement), as well as a few other constructive principles of the composition brought to my mind the famous pendulum built by Jacques Foucault in 1851 for a visual demonstration of the fact of the Earth's rotation. The title of the work also contains the allusion to the famous mystification novel by Umberto Eco, "Foucault's Pendulum." Ens. : 1.1.1.BCl.1. – 1.1.1.0. – 2Perc – Hp – 1.1.1.1.1. Одна из главных задач сочинения — через активное музицирование вовлечение детей в процесс создания веселого и динамичного представления. «Золушка» предполагает разные версии реализации — от концертного исполнения до полноценного театрального спектакля и допускает различные варианты исполнительского состава — от минимального (в норвежской постановке участвовало около 50 человек включая хор) до максимального (в Барбикан-холле в Лондоне принимало участие 250 человек). В основе детского оркестра — струнные и по желанию любые духовые инструменты (flexiband). Профессиональный ансамбль ограничивается 16 инструменталистами. Ens: 1(=BFl).0.1.BCl.0. – 0.0.1.0. – Perc – Bayan – Tape – M-Sopr – 1.0.1.1.1. Voices: 2Sopr,MSopr, CTen, Ten, Bar, Bas. Orch: 2(I=Picc,II=Picc,=AFl).1.1.BCl.1 – ASax, BarSax – 1.1.1.1.- 3Perc.- Pf(=Synth. )Hf – Guit.EGuit.BGuit –Soli:Vn.Vl.Vc – 5.0.3.3.1. Orch: 3(II, III=Picc).3.3(III=Picc).BCl. 3. – 4.2.2.0. – 2Perc – Hp – 0.0.8.6.4. Premiere — 1996, Polish Radio Concert Studio. Julius Berger, cello (Germany), Sinfonia Varsovia orchestra, conductor Wojciech Michniewski. Russian premiere — 21 November 2006, Moscow Conservatoire Grand Hall, Concert-closing of The 7th festival "Dedicated to Oleg Kagan". Performed by Natalia Gutman, cello, and Novaya Rossiya State Orchestra, conductor Yury Bashmet. Vladimir Tarnopolski. Scenes from Real Life for soprano, flute, French horn and piano, was written in 1995 with a commission from the Berliner Festwochen for Ensemble Modern. The composition is based on the texts of Austrian poet Ernst Jandl (1925-2000). This four-part composition unfolds in a similar way to a sonata-symphonic cycle: a dramatic and contrasting first movement (Allegro), a meditative second movement, a scherzo, followed by a final. However, these classical genres are presented in a sharply estranged way, modified by the character of the poetic text. In the first part, the hero's self-affirmation is materialized "stupidly, endlessy" within the grammatical formulae. In the second part the verses blur in the aura of the timbral-textural haziness (which is strictly organized serially). In the third part the performers exchange a few accidental words in three languages, reducing them to smaller units and transforming them in different ways. Finally, in the last part, which carries the subtitle "a la minimal rock", there is a series of intricate ostinato variations in rap mode — a perpetual motion, which turn out to be like running in place. Orch.I: 1(=Picc).1(=ASax).1(=Picc,=SSax).BCl(=ASax).Bsn(=CBsn). – 2.1.1.1. – 2Perc – Pf(=Cemb,=Cel) — 1.1.1.1.1. Ens: 1.1.2(II=BCl).1. – 1.1.1.0. – 2Perc – Hp, Pf solo – 1.1.1.1.1. 12 heterogeneous elements serve the material for the piece and represent the sound projections of the abstract elements of Vassily Kandinsky's art — dots, lines, zigzags, colour patches, etc. — a kind of a "musical zodiac". In the process of development the elements begin to interact, making, as in a kaleidoscope, different patterns, sometimes dispersing in musical space, sometimes concentrating into dense sound clots. The appearance of each of them, which at first is regulated only by probabilistic laws, is gradually included into a strict syntactic structure. Some elements remain unchanged during the entire composition, while others receive intensive development, painting the piece in dramatic tones. In the work process, the most important things for me were: to listen carefully to the spontaneous explosions of the unconscious, to address a pure, but not yet reflexing expression, to record a kind of "musical psychogramme". 12 éléments hétérogènes servent de matériaux de base pour la pièce et représentent les projections sonores des éléments abstraits de l'art de Vassily Kandinsky — points, lignes, zigzags, taches de couleur, etc — une sorte de "zodiaque musical". Dans le processus de développement, les éléments commencent à interagir, réalisant, comme dans un kaleïdoscope, différents modèles, parfois dispersés dans l'espace musical, parfois concentrés tels des caillots sonores denses. Ils apparaissent, régis au début par les lois probabilistes, progressivement intégrés dans une structure syntaxique stricte. Certains éléments restent inchangés pendant toute la composition, tandis que d'autres reçoivent un développement intensif, peignant l'oeuvre dans des tons dramatiques. Dans le processus de travail, le plus important à mes yeux était l'écoute attentive des explosions spontanées de l'inconscient, pour répondre à une pure expression, non encore "réfléchie" et d'enregistrer une sorte de "psychodrame musical". Ens: 1.1(=ASax).1(=SSax).BCl(=ASax).1. – 2.1.1.1(ad lib.). – 2 Perc – Hp, Pf, Balalayka (ad lib. ), Bayan – Sopr, Ten – 1.1.1.1.1. Ens: 1.1.2.1. — 2.1.1.0. — 3Perc – 1.0.1.1.1. Choral Prelude Jesus, Your Deep Wounds (1987) was written for the Ensemble of the Instrumental Soloists of the Bolshoi Theater and dedicated to its art director — Alexander Ivashkin. The visual imagery of its music is associated with Passions of Jesus Christ inherent in the old-time chorales: derision, castigation, betrayal, imprisonment, humiliations, tortures, and execution. The Prelude is based on the 16th-century Protestant chorale Jesu, deine tiefen Wunden. The traditional idea underlying the genre of choral prelude of commenting upon the chorale's text with a view to producing the expressive effect of castigation has found its instrumental theatrical manifestation in this case. Protestantism is often associated with naturalistic expression of feelings, which acquires its theatrical aspect making the first layer in this composition. In the course of their playing two percussionists move from the backstage towards the conductor depicting castigation in various forms (by beating on their hands and on the instruments). The conductor himself eventually becomes an "object" of castigation (he is to be "hammered in"), stopping dead in the posture of the crucified Jesus Christ. The theatrical element is explained here by the need to carry through the idea of musical commentary to its logical end. The second, antagonistic, layer is represented by the string trio (Trinity). Trinity means unity. Hence the violin and the cello are carrying on a mirror canon around the note F-sharp (up to the culmination point, then a simple canon; the viola has a free voice). The third layer is presented by the wind instruments engaged mainly in playing the chorale. On the whole, the form of Vladimir Tarnopolsky's Choral Prelude is based on the crescendo principle, with its dynamics developing through a gradual ascending "growth" to a sharp rupture at the end. Orch: 1(=Picc,=AFl).1(=EHrn).2(I=Picc,II=BCl).1(=CBsn). – 2.1.0.0. – 3Perc — Pf(=Cel) – Tape – Narrator –12.0.6.6.4. Orch: 3(II=Picc).3.3(II=Picc,III=BCl).3(III=CBsn). — 4.3.3.1. — 3Perc — Pf, Hp — 16.14.12.10.8. Orch: 3(II=Picc).3.3(II=Picc, III=BCl).3(III=CBsn). — 4.3.3.1. — 3Perc — Pf, Hp — 16.14.12.10.8.